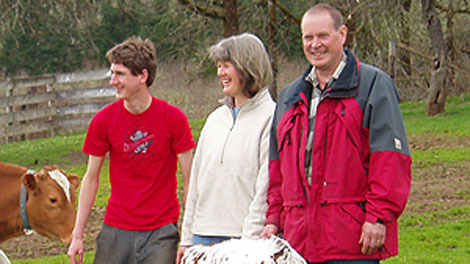 The Jondle family moved from the Silicon Valley in California to Polk County, Oregon in 2000. After 25 years of working as a software engineer, David Jondle and his wife Marilyn were “tired of corporate life” and wanted to pursue organic farming. Inspired by Joel Salatin’s book “You Can Farm,” they settled into a 210-acre sustainable farm. (Joel Salatin at one point agreed to teach the Jondles how to farm.) They called it Abundant Life Farm. Other reasons provoked the move to Oregon beyond the pursuit of an idyllic farming life. Andrew’s parents were concerned about raising him and his siblings (Wayne and Luke) in a “corrupting” place like California. The rural Northwest “felt more like God’s country to them.” So they made the move, and Marilyn homeschooled all three of the children. Wayne, the oldest son, did not like the farming life due to suffering terrible hay fever; as soon as he was old enough, he joined the military. The middle son Luke got married and relocated to Salem. Andrew was left alone with his parents. He was “bored to tears” with farming, but reportedly intended to take over the business. Andrew was charged with aggravated murder, murder, and burglary. In 2011, he was sentenced to at least 50 years in prison.